I think my new year resolution should be that I won't sew as many repeats! I saw this outfit on Pinterest and loved it, particularly the colours. Then I realised that with a couple of the fabrics in my stash I could put together my own version. 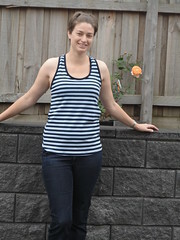 I made the pants (Simplicity 3686) a while back, but only just got a chance to make this top. It's another (my third) from the Balloon dress pattern, this time made up in a medium weight cotton knit. I just love the neckline and the drapey style, but this version doesn't hang as nicely as my other two. Simplicity 2865 got another run too. Caitlyn picked this animal print for a top a while back. I'd put off doing anything with it because I wasn't sure what style I wanted or how my machine would react to the burn out poly knit. 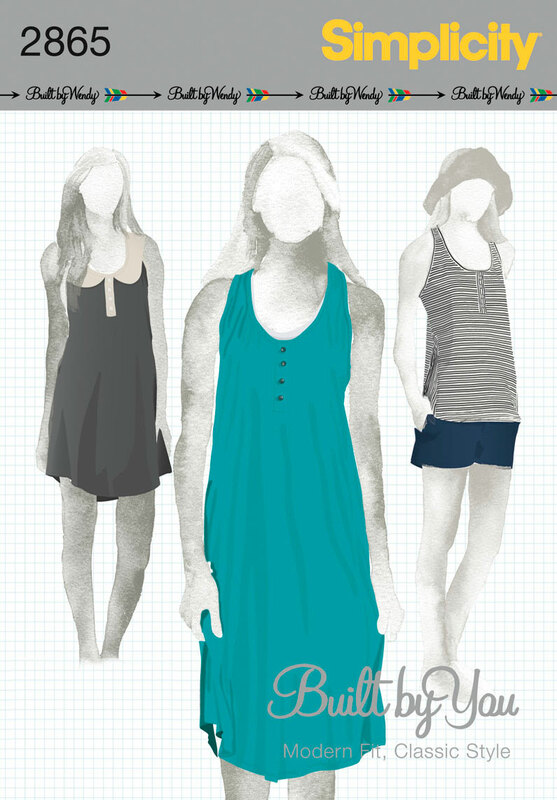 In the end I decided that a tank top for layering would be the best way to use it. I took these photos before I hemmed it but you can see that it's much higher in the front than at the back - a requested design feature. We're both really pleased with how our tops turned out. Sometimes simple really is best. I've got a really basic dress cut out and ready to go so I might manage to squeeze it in before the new year. Boxing Day is a day for relaxing, all the stress and hard work is over and you can put your feet up. We've just returned from my sister's house where we ate, drank and had a great time. I'm kicking back with a coffee and a bucket of peanut M&M's (healthier diets begin in the new year right?). I hope you all had a wonderful Christmas and I wish you all the best for the holiday period. 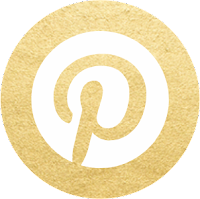 Thank you for reading, for commenting and, for my fellow bloggers, thanks for sharing your own sewing adventures. My first baby graduated from primary school last night. I was stoked when she asked me to make her a dress for graduation, I think I'm the only grade 6 mum that sews so the kids think it's pretty cool when I make things. This is Simplicity 2443. Again. According to the pattern measurements Caitlyn is smaller than the size 6. So I took a little off the side seams, the centre front and from the strap length. 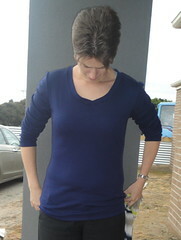 Turns out I probably could have made a straight size 6 because it's reasonably tight. Cait really wanted the wide elastic waistband and the ruffle fabric that we used for the skirt. I think the ruffle fabric is supposed to run the other way so that the ruffles sit flat, but Cait preferred it with the ruffles draping down. 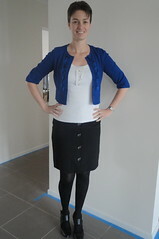 I self lined the top and used the same cotton knit to line the skirt so that everything was nice and opaque. We got a lovely surprise when Caitlyn received the academic excellence and behaviour award. We're so proud of her! This is view b of McCall's 6319 made up in a ponte knit. I'm really loving the ponte knits lately, they're so easy to sew. I've been waiting for it to warm up enough to wear this. I got up early to hem it this morning and then realised once I got in to work that I forgot to remove the water soluble fabric marker! The only change I made was to lengthen the bodice by an inch. Unfortunately I forgot to lengthen the lining pieces which I think is why you can see the lining peaking out at the neckline, even though it has been understitched, tacked to the side seams and pressed. I used the recommended tricot lining because two layers of ponte would have been too warm for a summer dress, but if I make it again I'd probably self line the top. I really love the pleats and the asymmetrical neckline. This dress feels very feminine and fun and is really comfy to wear. My daughter has been begging me to make her graduation dress, she graduates primary school next week, so that's what's up next. I know it sounds cliche, but I just can't believe how quickly she has grown up. I can remember walking her in on her first day of prep. Pretty sure I won't be allowed to walk her in for her first day of high school! I'll apologise right off the bat for the terrible photos. It has been pouring rain in Melbourne, everything is soggy and today is dreary and overcast so these are the best I could manage. 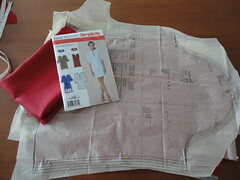 I bought Simplicity 3686 about 4 years ago when I really started sewing for myself. Up until then I'd been sewing lots of kids clothes but hadn't really made too much for myself. Then one day I stumbled across Erica B's blog and it gave me the jolt I needed to sew more for myself. Anyway, back to the pants. I made a version of View B. I left off the pocket flaps and the side strip, I shortened the waistband so it finished at the front and I added belt loops. There aren't any wrinkles when I don't have my hands shoved in my pockets. I didn't realise when I bought the pattern that sewing patterns and RTW sizes weren't the same. This pattern only goes up to a 14 and I need a 16. So to adjust these so they fit me I added 1cm to the the side seams and only used a 1cm seam allowance and I added extra length (2.5 inches if I want to wear heels). This time around I also added 1.5cm to the crotch curve by slashing and spreading the pattern and reduced the circumference of the legs by over 4 inches (these are really wide legged pants!). I found that when I sat down in previous versions they were just a little bit too tight in areas you really don't want it to be! It seems to have fixed the problem so I'm happy. Overall I'm pretty happy with the fit of these pants, certainly they're a better fit than anything I could buy at the shops. As soon as I saw this fabulous teal ponte knit in Tessuti I knew I was going to make another Simplicity 2443. This fabric is just a dream to sew with and wear - I really noticed a difference between the cheaper stuff from Spotlight and this lovely fabric. My favourite parts are the pockets and the the racer back. Unfortunately my sports bra isn't doing me any favours (it's tighter than my regular bras, hence the back bulges). This time around I added another inch to the bodice for a total of 2.5 extra inches of length and I think this looks better on me. I can't remember if I added extra length to the skirt last time, I didn't this time and I've left it unhemmed because I like the current length. I left the zipper off again too. This dress has been sitting waiting for me to attach the straps/bands for over a week but I just lost my mojo, I finally finished it last night so that I could wear it to work today. I'm not sure what I wore all last summer but I can't seem to find anything I want to wear. I think my sewing productivity is about to increase! This photo shows how I clip the bands to attach them smoothly in and around the tight curves. You haven't seen the last of this pattern, there's another modified version already in the pipeline. The weather is perfect today so we grabbed the camera and headed out to take some pictures of Simplicity 2584. Sorry about the blinding white legs - my youngest actually asked if I was wearing white stockings! If you don't like flashing your assets then I'd suggest you raise the neck split an inch or so. I forgot to raise mine but I'm not too woried, the interfacing in the neck facing stops the neckline from falling open so I don't feel too exposed. Am I making sense? 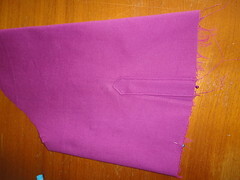 This is view B, I cut a 14 and used a beautiful linen from Tessuti Fabrics. This went together really quickly, probably because I left off the neckline applique piece, the hem tuck and the back zip. 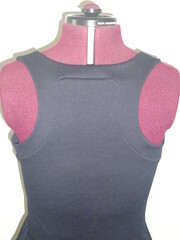 I basted the back closed to check the fit, but with the neckline split I found that there was no need for the zip. I don't plan on wearing this number to work so I hemmed it a little higher than I normally would. 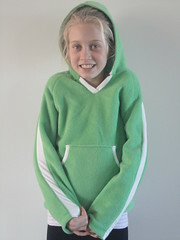 I've got another finished garment! Sadly it's too cold to take photos today but hopefully later in the week I'll get lucky. My beautiful linen from Tessuti finally arrived - apparently the courier company couldn't locate my house but didn't think to contact me, once I contacted them and provided directions they still failed to meet the delivery timeframe they gave me. Tessuti - please go back to Australia Post! Anyway - here it is all cut out and ready to be sewn up. Today was Melbourne Cup day, a public holiday in Melbourne, so I was free to play around in my sewing room. 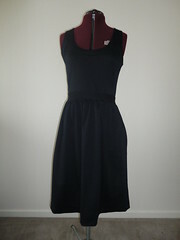 This dress is a really quick sew - I'll do a full write up when I grab some photos. 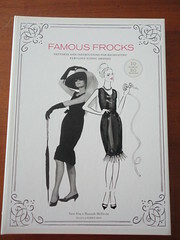 In other sewing news, I had a great day in the city with my sister last week and I made a few purchases. I know exactly what I want to make from every piece of fabric I bought and I have patterns for all but one of them. 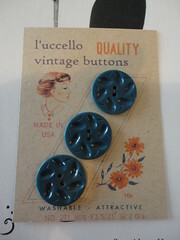 Purchases were made at Tessuti, L'uccello (who gifted us some sweet buttons) and Clegs. It's not sewing related (but definitely worth a mention) we had dinner at Parliament House with Hugh Delahunty and his lovely wife. They were great hosts, very warm and engaging people and the evening was lovely. I'm off to cut into that beautiful teal ponte knit from Tessuti. With any luck there will be enough left over for an extra project. I'm finally managing to carve out a bit more time for sewing and with the slightly warmer weather I'm thinking about summer. I've got a RTW dress in a very similar style to Vogue 1179 and I've also seen quite a few versions around the blog-o-sphere on women of all shapes and sizes so I thought I'd give it a go. The colour of this matte polyester jersey grabbed my eye on a recent shopping trip and I immediately thought of this pattern. 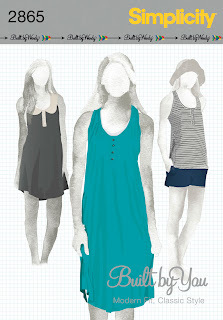 This is a super simple dress that can easily be completed in a couple of hours. I made this up straight out of the envelope in a size 14. My hem isn't as deep as recommended but I'm planning on wearing this to work so I can't have it too short. The armholes are quite snug and when I tried it on I thought I'd enlarge them, but after wearing the dress all day I'm going to leave it like it is. 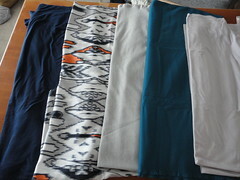 I don't only sew with knits - I've got a couple of wovens items cut out and a few other fabrics pre-washed. I'll just have to see which one calls my name the loudest. 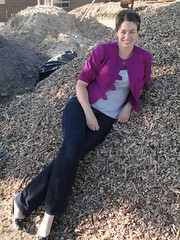 It has been too cold to wear my new dress, but I couldn't wait any longer to blog it. I loved this pattern as soon as I saw it. I put in a special request to a lovely American lady on Etsy and got my hot little hands on a copy as soon as it was released. Then it sat in my pattern stash patiently waiting to be used. 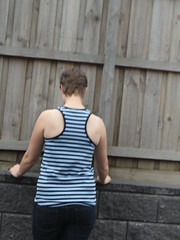 My favourite part of the dress is the back - love the racer back style. I wasn't sure about adding the pockets, I was worried they'd create a lot of bulk, but they're great and I don't think they make any difference to the silhouette. Basically I made the dress as per the instructions. A number of people have mentioned that they needed to shorten the shoulder straps, but it wasn't something I needed to do. I added 2 inches to the bodice and left out the zipper and the interfacing on the waistband. I found that clipping the corners so that they fanned out made it a lot easier to attach the straps on the curved sections, it wasn't difficult, you just need to be careful. 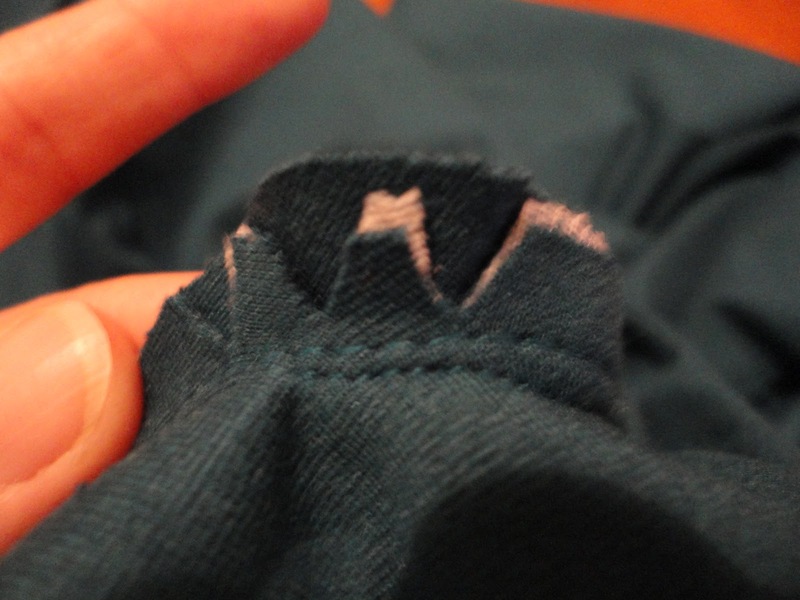 One thing I wanted to mention - the neckbands specify a 3/8 seam allowance everywhere except the should and side seams, so I assume you are supposed to use 5/8 for those seams. 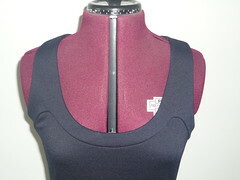 I used 3/8 for the shoulders and 5/8 for the side seams and the bands fit the top section perfectly. 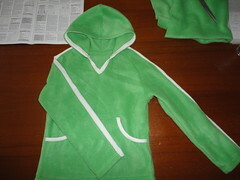 I've already got the jacket cut out and hopefully I like it because I've bought fabric to make a second. Because I still had the navy thread in my overlocker I whipped up another version of Kwik Sew 3740 in a beautiful merino jersey from Tessuti. I'm so close to having something finished to show you, but in the mean time here's a quick recap of what I've been wearing for week one of Self Stitched September (SSS). 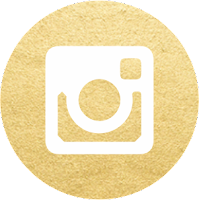 I've decided to extend my challenge a little bit too, for the next three weeks I want to wear a SS outfit once a week, rather than just one item, and dresses don't count. My Frankenpattern dress - top half is Simplicity 2281 and the bottom half is Vogue 8685. 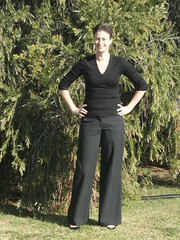 Simplicity 3686 pants - a sad day as we attended a family funeral. My most recently finished item - Kwik Sew 3740 top. Feeling terrible in Ottobre leggings - can't remember the issue details but they're on the blog somewhere. No outfit today. I spent the entire day in bed sick. Back to work in a BWOF skirt - my very first time sewing from the Burd World of Fashion magazines.